Charmoso e confortável casa de cidade Albaicin bem decorados e mobilados de uma forma tradicional espanhola com um sabor mourisco. O Albayzin / Albaicin 'Património Mundial' é a parte mais antiga e mais bonita de Granada. Artistas locais de flamenco tocam nas barras e praças. A casa tem vistas espectaculares sobre a Alhambra e o Generalife, caiu pelas montanhas cobertas de neve da Serra Nevada. Devido ao aspecto sul, a casa está cheia de luz. Do terraço superior há uma vista panorâmica do palácio Alhambra, o Albaicin e incríveis pores do sol. A casa foi totalmente renovado embora ainda cheio de personalidade. Levando da cozinha há 2 cavernas tem um sofá-cama que tem uma temperatura confortável no inverno e no verão. A casa tem todas as conveniências modernas em oferta, como uma cozinha totalmente equipada, 2 casas de banho, aquecimento central e ar condicionado. Ele está situado em uma rua tranquila, a 2 minutos de distância do burburinho única do praças Larga & Aliatar com mercado, restaurantes, bares e lojas. A 5 minutos a pé do centro de Granada é um deleite visual, você pode caminhar até o Alhambra ou pegar o ônibus hopper, localizado em San Salvador-2 minutos de distância. Existe uma entrada privativa coberta para manter motos ou esquis. We are so glad we stayed in the Albaicin area of Granada and used this beautiful home as our base! This unique, interesting, and historic area is reflected perfectly in Sarah's home. We truly felt like were in a different world. The home is exactly as pictured plus Sarah's very thoughtful touches and modern conveniences (well connected tv, great wifi, dish washer, laudry machine). The porches were perfect for our breaks from touring as they let us continue to soak in the gorgeous environment from the comfort of home. In late March, the mornings and nights were chilly but the heating system and hot water were great. The house's location is great - close to everything but quiet enough that we woke to birds singing and church bells ringing. Sarah was a most gracious and responsive host before and throughout our stay. She manages this property with a lovely personal touch. She is welcoming, helpful, and a great communicator. In response to my request for a tour guide, she connected us with Rafael Anderson who gave my family an interesting tour of the Albaicin neighborhood. He pulled together all the facts about the architecture, history, and geography of the area and put it in a context that helped us all (ages 9-55! )truly appreciate what we were seeing. The Albaicin deserves several days of exploration and this home is a perfect place from which to do it. We highly recommend this home! The house is very nice and comfortabel, situated on a beautiful location on walking distances from the Alhambra. 3 spacious bedrooms, 2 bathrooms, 2 balconies with a direct view on the Alhambra and the Sierra Nevada. Couldn’t wish for a better place to discover Granada. The owners were really friendly and arranged groceries before arival. We (me, my wife and 3 doughters) couldn’t wish for a better place! We stayed here with a couple of friends and we loved it. The house is lovely, in a great location and watching the sun set from the balcony was delightful. Sarah gave us some great recommendations and was really helpful with our arrival and departure times. Highly recommended. Brilliant position in The Albaicin with fantastic views of The Alhambra. We loved everything about this property, so full of character and very comfortable for the three of us, myself , my husband and our son. It would certainly accomadate 4 adults and 2 teenagers/ children very easily with extra space in the 'cave' for younger children if needed. It's a very short walk to the local shops and restaurants where you will find everything you need. The walk down to the centre of town is an easy stroll and full of interesting places to stop off and look around, plus cafes abound for the odd coffee on the way. The bus service back up to The Albaicin is reliable and frequent so you don't have to worry about walking back up the hill! We really didn't feel we needed a car during our stay. Sarah is a really helpful hostess and very accommodating, she went out of her way to organise taxis to the airport etc. The bottle of wine she left out for us on our arrival, plus other food stuffs in the fridge were very welcome. We would certainly return to this property if we get the chance to visit Granada again in the future. Sarah was a great host. We needed a next day replacement for a VRBO place that cancelled on us and she responded immediately. Met us at the door, showed us around the apartment, gave us a good orientation to the area. The apartment is a three floor residence on a narrow Granda street. The Albaicin is a somewhat restricted area so you need to either walk to the apartment or take a taxi. You need to be able to navigate stairs with luggage. Bedrooms are adequately appointed. 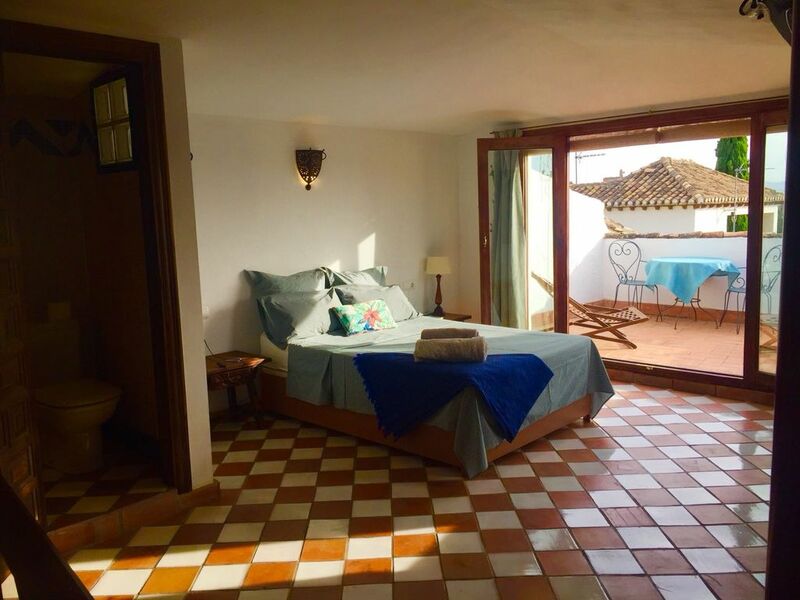 The third floor bedroom has a terrace with a view of the Alhambra. Beautiful place to enjoy a nightcap. This bedroom also has a small en suite. The two second floor bedrooms - one is a double bed with ample space. The other is a single bed. The second bathroom is on that floor. There is a cave room that is the original house. It was musty and we didn't use the space at all. Linens were good quality, towels supplied, some toiletries but bring your own. Kitchen is small, well equipped for our three night stay. The main floor has the kitchen, an eating area, and a sitting room.The sitting room opened onto another terrace with ample seating. Apartment was clean. We loved our stay there. We have used VRBO and Airbnb on several of our European trips. The key success issue for us has been communication with the host. Sarah was excellent on this score. Just picture postcard pretty. It was comfortable and well-equipped, with plenty of room for five adults. (I do have to say that no one in our group found the “cave” bedroom very appealing). The neighborhood is great, with many good restaurants and shops. After stays in Barcelona, Madrid, and Sevilla, the Albaicín seemed a “world apart” in the perfect way. The walks to San Nicolas viewpoint and “down the hill” to the Old Town area are short and easy. There are plenty of buses and taxis to bring you back again. Love this house!